STORIES OF CERTAIN GREAT ROMANS. In the three hundred and ninety-third year after the building of the city there was seen suddenly to open in the market-place a great gulf of a deepness that no man could measure. And this gulf could not be filled up though all the people brought earth and stones and the like to cast into it. But at the last there was sent a message from the gods that the Romans must enquire what was that by which more than all things the State was made strong. "For," said the soothsayer, "this thing must be dedicated to the Gods in this place if the commonwealth of Rome is to stand fast for ever." And while they doubted, one Marcus Curtius, a youth that had won great renown in war, rebuked them saying, "Can ye doubt that Rome hath nothing better than arms and valour?" Then all the people stood silent; and Curtius, first beholding the temples of the immortal gods that hung over the market-place and the Capitol, and afterwards stretching forth his hands both to heaven above and to this gulf that opened its mouth to the very pit, as it were, of hell, devoted himself for his country; and so, being clothed in armour and with arms in his hand, and having his horse arrayed as sumptuously as might be, he leapt into the gulf; and the multitude, both of men and women, threw in gifts and offerings of the fruits of the earth, and afterwards the earth closed together. About the space of thirteen years after these things there was again war with the Gauls; and when the Romans had levied a great army of ten legions of men, Camillus the Consul (being son to that Camillus that the city in time past) marched therewith into the Latin plain, and pitched his camp near to the marshes by the sea, over against the camp of the Gauls. And while the two armies lay quiet, a Gaul of great stature, and having splendid arms, came forth, who, striking his shield with his spear, by way of token that he would have silence, challenged by the mouth of an interpreter any one that would of the men of Rome to do battle with him. Thereupon a certain Marcus Valerius, thinking that he might win for himself like renown with Manlius, that was surnamed of the Twisted Chain, came forth fully armed into the space between the two armies, having first obtained permission of the Consul. When these two were about to join battle, a crow lighted suddenly upon the helmet of Valerius, with his face towards the Gaul. And Valerius received it with joy as an augury sent from heaven, crying out, "May the god or goddess that hath sent this bird of good omen to me be favourable to me and succour me." Then, marvellous to relate, the bird not only remained steadfast in the place whereupon it had lighted, but as soon as the two began to fight together, raised itself upon its wings, and wounded with its beak and claws the face and eyes of the enemy, so that, terrified by so marvellous a thing, he was easily slain by Valerius. Now, up to this time the foremost lines of both armies had remained quiet; but when Valerius began to strip the spoils from the body of the dead man, the Gauls ran forward to hinder him. Then with yet greater speed ran the Romans to his help; and there was a great fight about the dead body. And Camillus seeing that the men were confident by reason not only of the valour of Valerius, but also of the manifest favour of the Gods, he cried aloud, "Soldiers, do as Valerius hath done, and slay multitudes of Gauls as he hath slain their champion." Thus was there won a great victory over the Gauls, for though some of them fought valiantly, the greater part fled before even the Romans had come within a spear's cast of them. As for Valerius, he was made Consul in the year following, though he was but twenty and three years of age (It was not lawful in those days that a man should be Consul till he was forty and two years of age); and he and his posterity after him had for themselves the surname of Corvus, which is, being interpreted, a crow. In the four hundred and twelfth year after the building of the city there was war between the Romans and the Samnites, in which war, when the one Consul, Valerius, had won a great victory, the other, Cornelius, was well-nigh destroyed together with his army. For, leading his soldiers into a certain narrow pass, he did not perceive that it was surrounded on all sides by the enemy, and that these were also on the higher ground above him. And while he doubted what he should do (for it was no longer possible that he should return by the same way by which he came), a certain Decius Mus, being a tribune of the soldiers, perceived a hill above the camp of the enemy, and that this hill might easily be climbed by soldiers lightly armed. Thereupon he said to the Consul, "Cornelius, seest thou that hill? Thereby we may save ourselves if we only make haste and occupy it; for the Samnites are blind that they have not occupied it before. Give me only the front rank and the spearmen of one legion; and when with these I shall have climbed to the top, do thou move forward with the legions, fearing nothing, for the Samnites cannot follow thee, having to pass this hill. As for us, the fortune of the Roman people or our own valour will deliver us." And when he had said this, leading his men by secret paths, he climbed to the top of the hill, the Samnites not perceiving what he did. And while these doubted what they should do for wonder and fear, the Consul escaped with his army. As to Decius also, they knew not whether they should surround the hill on all sides, and so shut him in, or, leaving a way open, should attack him when he should have come down to the plain. And while they doubted, darkness came upon them. At the first Decius thought that the enemy would come up the hill against him, and that he should fight against them with advantage from the higher ground, but when they neither came nor yet began to build a rampart round the hill, he called his centurions to him and said, "What ignorance or indolence is this in these men, that they sit still and do nothing when they might by this time have shut us in? Surely we shall be as bad as they if we stop longer in this place than shall be convenient to us. Come then with me, and while there is yet some light, let us see where they have set their guards, and where we may find a way of departing from this place." So the centurions, having clad themselves in the garb of common soldiers, lest the enemy should know them, spied out the nature of the place. Afterwards, when he had posted the sentinels, he commanded that the rest of the soldiers should assemble at the second watch. To them he said, "Ye must hear my words in silence, not signifying your assent by a shout in soldiers' fashion. Such as shall approve my counsel let them come over to the right side; and if the greater part of you shall so come, we will abide by it. The enemy having neglected to occupy this place at the first, have neglected also to to shut us in with a rampart. Stay we cannot, lest we perish with hunger and thirst. Sally forth we must, if we are to be delivered. And if we wait for day, can we doubt that the enemy will do that which he should have done long since, and make a ditch and a rampart about the place? Night therefore is the better time, and if the night, then also this hour of the night is better than all others; for at this second watch the sleep of men is commonly the deepest. Follow me therefore even as ye have followed me hitherto. Let them to whom this counsel seems good come over to the right side." They came over all of them, and followed Decius as he led the way by a place which the enemy had left without guards. But when they were now come to the middle of the camp, one of the Romans, as he would have stepped over a sleeping man, stumbled upon his shield and so woke him. The man roused his neighbour, and he again others; and Decius, perceiving that he was discovered, commanded his men to shout; and the Samnites, being confused and scarcely yet awake, nor able to bestir themselves, could not hinder him and his men from escaping. The next day, after he had entered the camp of the Consul (for though he reached it before the night was spent, he would not enter till it was day, thinking that they came back to their countrymen with such glory as should not be concealed by darkness), Cornelius summoned the soldiers to assembly and began to set forth the praises of Decius. But Decius said, "I would counsel, Cornelius, that you postpone everything to the occasion of victory that is now given you. Attack the enemy while they are in confusion and scattered, for doubtless many have been sent to pursue me." This the Consul did, and won a great victory over the Samnites, and took their camp, wherein were slain, it is said, thirty thousand men. As for Decius, the Consul gave him a golden crown and a hundred oxen, whereof one was white and of surpassing beauty, having gilded horns. And to each of the soldiers that had followed him he gave a double portion of corn for ever and an ox and two garments. And the legion set on the head of Decius a crown of grass, by which was signified deliverance from siege; his own men also gave him another such crown. Then Decius sacrificed the white ox to Mars, and gave the other oxen to his soldiers. To these men the rest of the legions made a contribution, a pound of corn and a pint of wine for each. In the third year after these things, Decius being then Consul together with Manlius, there was a great war with the Latins. And while the armies lay over against each other in a place near to the city of Capua, there appeared to both Consuls, as they slept, the same figure of a man, only of greater stature and of more dignity than belongs to man, which figure spake to each the same words: "There is due to the Gods that dwell below, and to Mother Earth, from the one side a general, and from the other an army. And on which side soever of these two a general shall devote himself, together with the army of the enemy, to the Gods below and to Mother Earth, that side shall have the victory." When the Consuls had told their dreams one to the other, they ordered that sacrifices should be offered to avert the wrath of the gods; and that if the soothsayers examining the entrails of the beasts should find the signs therein to agree with the dreams that they had dreamed, one or other of the Consuls should fulfil the decree of fate. So they sacrificed the beasts, and hearing from the soothsayers that such signs had been found, they called the officers together and told them how they agreed that if either side began to give way the consul then commanding should devote himself for the Roman people and for his country. On the morning of the day when the battle was fought (the place being near to Mount Vesuvius) the Consuls offered sacrifice each for himself. Then the soothsayer showed the Consul Decius how, the signs being in other respects altogether favourable, the head of the liver was wounded on that side that regarded himself. Manlius, on the other hand, found all things altogether favourable. Then said Decius, "It is well if the offering of my colleague has been accepted." After these things they marched forth to the battle, Manlius commanding the right wing and Decius the left. For a while both armies fought with equal courage and strength. Then the Roman spearmen, being the front rank, gave way before the Latins, and fell back upon the rank behind them. Thereupon Decius cried with a loud voice to Valerius, "Valerius, we have need of the help of the Gods. Come therefore, and, as high priest of the Roman people, dictate to me the words in which I may devote myself for the legions." Then the high priest bad him put on the robe that is called Prætexta--that is to say, having a stripe of purple about it-and to cover his head, and, thrusting his hand under his gown up to his chin, to say after him these words: "O Janus, Jupiter, Father Mars, Quirinus, Bellona, Gods of the households, Gods of the land, Gods of the dwellings below, I beseech you that ye grant strength and victory to the Roman people, and send upon the enemies of the Roman people terror, and panic, and death. And now I devote myself, and with me the legions of our enemies, to the infernal Gods, on behalf of the commonwealth of Rome and the legions of the Roman people." Then girding himself after the manner of Gabii, and taking his sword, he leapt upon his horse and hastened into the midst of the enemy. To both armies he seemed to be more than man, being sent, as it were, from heaven, to avert the anger of the gods, to avert destruction from his countrymen, and to bring it upon his enemies; and the Latins were overwhelmed with terror, giving way before him wherever his horse carried him, and when at last he fell slain by a shower of javelins, flying from the place where he lay. As for the Romans, they fought with greater hope and courage, as knowing that they had been delivered from the anger of the gods. When the battle had now lasted many hours, and the Latins had no fresh soldiers to bring up, the consul Manlius cried to the veterans whom he had kept behind, kneeling on one knee, till they should be needed, "Rise, and deal with the enemy as men that are fresh to the battle should deal with the weary. Remember your wives and children; remember also your Consul that has died that ye may have, victory." So the veterans rose and advanced, bringing up a fresh line against the enemy; nor could these withstand them, but turned and fled. Many were slain in the field, and many also in the camp, which was taken that same day. The day following the body of Decius was found, covered with javelins, with many dead corpses of the enemy about it; and the consul Manlius made for this a great funeral. In the forty-second year after these things, Publius Decius Mus, being son to that Decius who devoted himself for the army in the battle of Mount Vesuvius, was made consul together with Quintus Fabius, having been consul three times before. In that year the Gauls had leagued together with the Etrurians against the Romans, having also upon their side the Umbrians and the Samnites. And the armies pitched their camps near to Sentinum, having a space of about four miles between them. Now it had been agreed among the enemy that on the day of battle the Gauls with the Samnites should fight with the army, and that the Etrurians with the men of Umbria should attack the camp. But this counsel certain deserters from Clusium declared to the Consuls. Thereupon the Consuls sent word by letter to their lieutenants that they should lay waste the country of the Etrurians. And this they did, working such destruction that the Etrurians with the men of Umbria straightway departed, that they might defend their own possessions. Then the Consuls made haste that they might fight before these should come back. For two days, therefore, they challenged the enemy to battle; but though a few were killed on either side, nothing worthy of note was done. But on the third day both the armies came down into the plain ready to do battle, and, while they stood, a hind that fled from a wolf ran down from the mountains across the plain that lay between the two hosts, and the two beasts went different ways, the hind among the Gauls and the wolf among the Romans. The hind, indeed, the Gauls slew, but the Romans gave place to the wolf to pass through their lines. Then a soldier that stood in the front rank cried aloud, "Look ye, flight and slaughter go that way where ye see the hind, a beast that is sacred to the goddess Diana, lie dead; but to us the wolf of Mars, whom we have left unharmed, is a pledge of victory, reminding us of him of whose race we come." On the right wing of the enemy were the Gauls, and on the left the Samnites, Quintus Fabius being set to fight against these, and Decius Mus against the Gauls. At the first when the battle was begun the strength on either side was so equal that, if only the Etrurians or the men of Umbria had been there, the Romans had doubtless suffered some great loss either in the field or in the camp. Nevertheless the fashion of the battle was not the same in both wings. For Fabius and his legions defended themselves rather than attacked; Fabius judging that the Gauls and Samnites were most to be feared at their first charge, and that if only this could be sustained the day would go well with the Romans; the Samnites growing slack in valour, and the Gauls being unaccustomed to endure toil and heat for a long space of time, so that at the first they would fight with more than the strength of men, and at the last with less than the strength of women. Wherefore he kept the best strength of his soldiers till such time as the enemy were accustomed to be worsted. 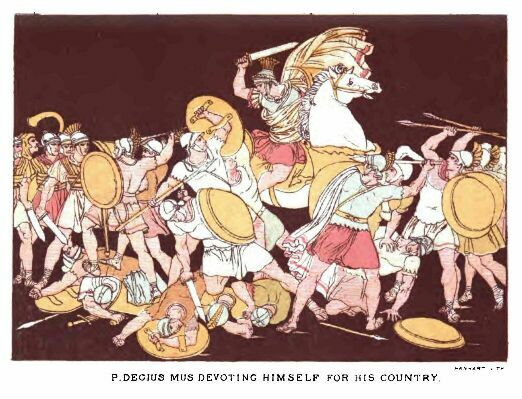 But Decius, being vigorous in body and of a high spirit, used his whole strength to the utmost in the very beginning of the battle. And because the foot soldiers seemed to him to fight with a certain slackness, he brought up the horsemen to their help. Then riding into the midst of one of the squadrons in which were many youths of noble birth, he cried to them, saying, "Follow me against the enemy. Ye shall win for yourselves a double share of glory if the victory shall be first won on this side." Twice did they put to flight the horsemen of the Gauls; but when they charged now for a third time, riding far on among the enemy, they were thrown into confusion by a certain new and strange manner of fighting. For suddenly there came upon them a number, of the enemy that stood upon chariots, and who, advancing against them with a great noise both of horses' hoofs and of wheels, affrighted their horses. Thus there came a sudden panic upon them in the very hour of their victory, and turning their backs they fled headlong. Then the legions also were disordered, many that stood in the front rank being cast to the ground and crushed, both by their horsemen and by the chariots of the enemy. And when the Gauls saw how the Romans gave way they pressed on, giving them no breathing space nor time of recovery. Then cried the Consul Decius, "Whither do ye fly? what hope have ye in flight?" And he strove to stay them as they fled, and call them back into the battle. But when he saw that he could avail nothing, so overwhelmed were they with fear, he called aloud on the name of Publius Decius, his father, and said, "Why do I delay any longer the fate that belongs to my race? This is the privilege of my house, to be victims whereby the dangers of the commonwealth may be expiated. Therefore I give myself, and together with me the army of the enemy, to Mother Earth, and to the Gods of the dead." When he had so spoken, he bade Marcus Livius, the high priest (on whom, when he went into the battle, he had laid his commands that he should never depart from his side), dictate the words by which he might devote himself and the army of the enemy for the army of the Roman people. Then he arrayed himself in the same manner and prayed the same words as his father had done in the battle by Mount Vesuvius. To this he added these words, "Lo! I carry before me terror and flight, slaughter and blood, and the wrath of the Gods of heaven and of hell; with the curses of death will I smite the standards, weapons, and armour of the enemy, accomplishing in one and the same place my own destruction and the destruction of the Gauls and of the Samnites." And when he had thus cursed both himself and the enemy he spurred his horse into the lines of the Gauls, where he saw them to be thickest, and so fell pierced through with many spears. After the death of Decius the Romans fought with such strength and courage as seemed beyond the nature of men. For the Romans, when their leader was dead (a thing that commonly is wont to be the cause of much fear), stayed from their flight and took heart to begin the battle afresh. But as for the Gauls, and those especially that stood about the dead body of the Consul, they cast their javelins at random and to no purpose, as though they were beside themselves; and some were so stupefied with fear that they could neither fight nor fly. Then Livius the high priest, to whom the Consul Decius had given over his lictors, bidding him take upon himself the command, cried aloud, "The Romans have conquered, being delivered from peril by the death of the Consul. The Gauls and the Samnites are the possession of Mother Earth and of the Gods of the dead. Decius is calling and drawing to him the army that he devoted to death together with himself; and the whole host of the enemy is full of madness and fear." And while he set the battle in order again on this side of the field there came up two lieutenants whom Fabius the Consul had sent from the rereward to the help of his colleague. And when they heard that Decius was dead, and in what manner, they all addressed themselves to the battle with fresh courage. So when the Gauls stood in close array, with their shields set up before them, and it seemed no easy thing to come to close combat with them, the lieutenants commanded that they should gather together the javelins which lay on the ground in the space between the two armies, and cast them against the shields of the enemy. And when most of these pierced their shelter, and some that had the longer points were even driven into their bodies, the army was overthrown, not a few falling to the ground though their bodies were unhurt. Such changes of fortune were there in the left wing of the Romans. Meanwhile, in the right wing, when Fabius perceived that the enemy shouted not as loudly as before, nor cast their javelins with as much strength, he commanded the captains of the horsemen to take a compass with their squadrons and fall upon the Samnites in the rear when he should give the signal. This done he bade the legions advance their standards. And when he saw that the enemy were beyond all doubt wearied with fighting, he called to him all the reserves that he had kept back for this end, and gave the signal, so that the legions fell upon the enemy from before and the horsemen fell upon them from behind at one and the same time. Thereupon the Samnites turned their backs and fled with all speed to their camp; but the Gauls, locking their shields in close array, stood fast. And now there came tidings to Fabius how that his colleague was dead; and when he heard them he bade the Companion Knights, being a company of about five hundred horsemen, leave the line and fall upon the Gauls in the rear; with whom went also a part of the third legion, to fall upon the enemy wherever their line should be broken by the horsemen. And he himself, having first vowed a temple and all the spoils of victory to Jupiter the Conqueror, marched to the camp of the Samnites. Then again was there a battle, for the multitude of them that fled was so great that they could not enter by the gates, so that they fought perforce. Then Egnatius, captain of the host of the Samnites, was slain. And in no great space of time the Samnites were driven within the ramparts and the camp also was taken. The Gauls also, being surrounded on all sides, could withstand the Romans no more. That day there fell five and twenty thousand of the enemy, and eight thousand were taken alive. Nor did the Romans escape without damage, for in the army of Decius were slain seven thousand and in the army of Fabius one thousand seven hundred. Fabius, having first sent men to search for the body of his colleague, gathered together in a great heap all the spoils of the enemy, and offered them for a burnt offering to Jupiter the Conqueror. On the morrow they found the body of Decius, covered with dead bodies of the Gauls, and brought it back to the camp amidst much weeping of the soldiers. And Fabius made for him as great a funeral as he could prepare.